Our day started at 8:15 with breakfast at the Tilajari Hotel, where we stayed the night before. 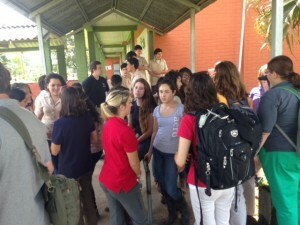 After breakfast we headed to the Santa Clara High School to talk to their agriculture students. We were each paired with at least one student who helped explain what they did at their school both in studies and for fun. They told us about their hobbies, ambitions, families- everything right down to their pets and favorite foods. They were also interested in how we lived and asked us many questions. Some of the students spoke fluent English, while others only knew a few words. The language gap could have been a big problem for some, yet our group was up for the challenge. We learned so much from them during the short time we were able to spend with them. We continued our day with lunch at Moleku Historical Village. 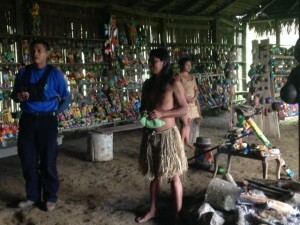 After lunch we had a tour of the village including a presentation by some members of the tribe. They explained their history and how they live today. Afterwards we loaded up on the bus and headed to the next hotel, Hotel Fortuna. After we changed into more comfortable clothes, we headed out to tour the town of Fortuna and to shop! From pastries to hammocks and little trinkets, we enjoyed the quaint little town. Dinner was served at a restaurant down the street from the hotel. We meet with Jorge and his wife who own one of the largest dairy farms in Costa Rica. After filling our bellies with wonderful food, we headed back to the Hotel Fortuna to spend some quality time with each other, relax, and reflect after a long day in the beautiful Costa Rica. • Wow! Kale, Lettuce, Garlic, and Tomatoes! !